Oink! 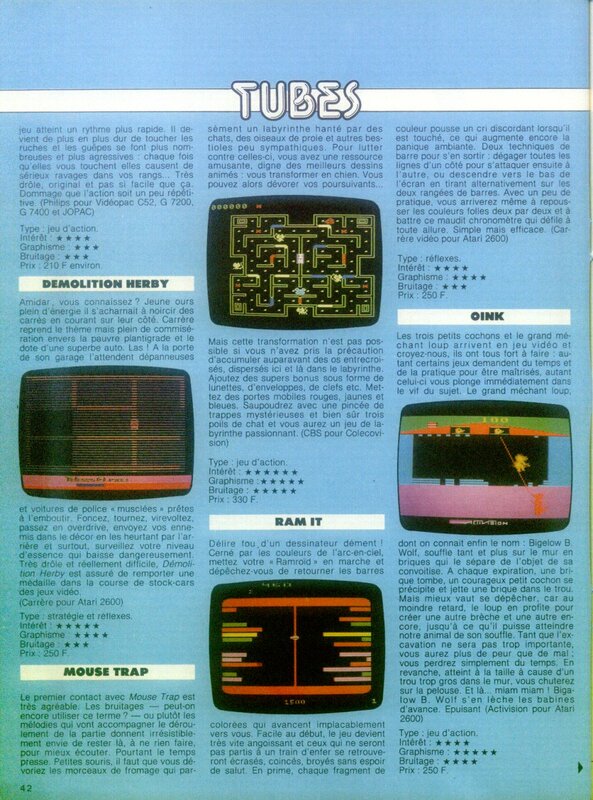 by Activision is among the unique games for the 2600. It's a fun game that puts you inside a fairy tale. Worth picking up if you can find it. Activision bewies mit Oink! wieder einmal ihren Mut zu neuen Ideen. So wurde eine bekannte Kindergeschichte geschickt in ein Spiel verpackt, das nicht nur allein, sondern auch zu zweit Spaß macht. Selbst an kleine Details der Geschichte, wie die Beschaffenheit des Hauses (Holz oder Lehm) wurde anhand der Farbe berücksichtigt. Wer also gern Retrogames mit seinen Freunden daddelt, wird hier ein passendes Spiel zum gemeinsamen Wettstreit finden. Übrigens wer verzweifelt nach einer deutschen Version von Oink sucht und bisher noch nicht fündig geworden ist: Das Spiel ist auch von Quelle unter dem Titel Fuchs und Schweinchen Schlau erschienen und deutlich häufiger in unseren Breitengraden aufzufinden. Les trois petits cochons et le grand méchant loup arrivent en jeu vidéo et croyez-nous, ils ont tous fort à faire : autant certains jeux demandent du temps et de la pratique pour être maîtrisés, autant celui-ci vous plonge immédiatement dans le vif du sujet. Contrary to the impression the story line and title may give, I don't believe Oink! was designed with the younger audience in mind. It's a moderately difficult game that is a true test of stamina. So is running a marathon. Personally, I'd prefer the run to Oink! I'd be so busy huffing and puffing, I wouldn't have time to yawn. Some of the game’s sounds seem to be lifted from the 2600 version of Super Breakout, but considering the nature of the game I’ll leave it to you to decide whether it’s theft or tribute. The pigs and the wolf are well-rendered and the whole game is very colourful as per Activision’s typical standards. It’s not the greatest game on Earth but it will probably keep you hitting reset for “one more game” for an hour or so. Oink's graphics are actually quite good, with large, detailed characters. But the game suffers from a serious lack of fun. Going back and forth carrying bricks to the biggest hole is mind-numbing and hard on the wrist. With little variety or strategy, you may find yourself rooting for the wolf.